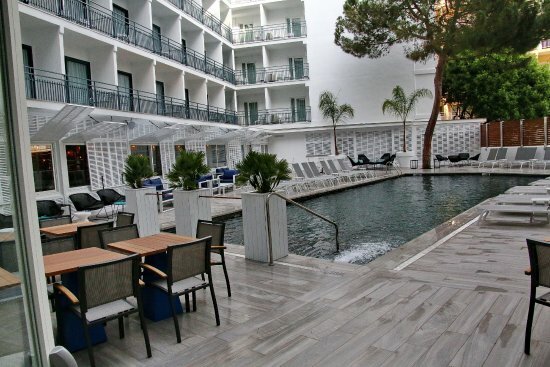 The popular Delamar Hotel is centrally located in located in Lloret de Mar just 150 metres from the beach. To the front of the hotel there are plenty of bars and numerous shops, restaurants and nightclubs. Hotel Delamar is located in the heart of the town, in the immediate vicinity of shops, bars and restaurants and only 150m from the beach. Girona airport is just 30 minutes drive from the hotel. As the hotel is centrally located in the city it is surrounded by several golf courses including one of the top ranked courses in Spain PGA Catalunya Golf Course. There are several types of stylish rooms available all of which are equipped with modern decor and include air conditioning, 43-inch flat-screen TV, a mini fridge, a kettle and coffee and tea facilities. The bathroom features a rain shower system, a hairdryer and a magnifying mirror. The hotel offers modern facilities, fine aesthetics and a varied gastronomic offer as well as a wide range of activities such as hiking, pilates and yoga classes as well as live music. The swimming pool is located on the ground floor. It is the meeting point of the hotel. Ideal for breakfast, refreshment during the day and have a drink after dinner. Hotel Delamar’s Els Americanos Restaurant serves breakfast, lunch and dinner and features show-cooking. It offers healthy and varied Mediterranean dishes. Other facilities include a library and a shared lounge. The property has a 24-hour front desk and a tour desk service. Free luggage and golf equipment storage is available. Bicycle storage is also available for free, upon request. The gym is open 24-hours.